Natural citrine is pale and translucent, sometimes it resembles a very pale smoky quartz. Heat treated citrine has deep coloured terminations of yellow, gold or brown with milky white bases. Ametrine has elements of both citrine (yellow in colour) and amethyst (violet in colour). Citrine is well known to be a success stone, it is ideal for those in business wishing to have a successful business it creates abundance within the business and promotes prosperity in the business. Ideally you want to have the citrine in your cashbox, carried or worn to promote prosperity within your business. It is a great crystal in conquering negative energy and influences in the business and around ones aura. Citirne corresponds to the solar plexus chakra, it gives one a sense of personal power when close to the person, with personal power comes confidence which can be focused intent of the individual in a particular adventure, as it brings will power. It is also ideal for psychic awareness, mediation and spiritual development. As citrine removes unwanted energy and paves the way spiritual and psychic growth. Since citrine removes negative energy, it is good for protection and brings stability energetically. Citrine also does not absorb any negative enegry, therfore there is no reason to cleanse citrine energetically. Citrine is ideal for those that need a sense of self-confidence, it helps to eliminate fears of being judged. Citrine will also dissapate the feelings of being alone and unworthy of love. Citrine is overall a happy crystal, brings warmth and happiness in the lives of those that use it. I have not had really any experiences with citrine, other then noting it is a warm and positive crystal which brings a sense of calm over the person. If you need a suggestion on what crystal you may benefit from please contact me and I can advise you on what I think may help with your current problems/issues your facing at present. The Amethyst crystal colour of purple and violet comes from iron particles found in the crystal. Amethyst corresponds to the (crown chakra) located at the top of the head which oversees the balance of the chakra system and higher spiritual growth. In my experience Amethyst is a wonderful, gentle and helpful crystal. 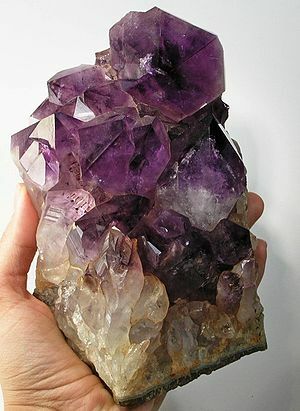 I would recommend anyone to have at least one piece of Amethyst if they are going to buy crystals for healing. It has a variety of uses which I will discuss in further detail below. It also is a lovely in colour which varies slightly from piece to piece. However it is a purple – violet colour. One day, a few years ago now I had a really bad headache and had to lie down on my bed, to see if I could rest in order to ease my headache. However resting was not working and I didn’t want to take any pain killers as I try to avoid in doing so. So I decided that I would use one of my tumbled pieces of Amethyst to soothe my headache, it’s just something I felt I should try. So after grabbing my tumbled piece of Amethyst I decided to lie on my bed and place the Amethyst piece on my forehead (where my third eye chakra is located). I left it there for about 3-5 minutes and then held it against each of my temples for again about 3-5 minutes each side. After which I had found my headache had dissipated and my head felt clear and lighter after a few more minutes my headache had practically disappered altogether. It is the most useful all-purpose crystal to be used by crystal healers. It is a powerful and highly spiritual crystal. Used for overall protection – such as psychic attack, protective when travelling and ideal for children that are being bullied or teased at school. It has been a long time since I made my last post on my blog and I do apologise for that. I just have been very busy with my study and now organising to work for myself. I have decided that I want to take up blogging again and blog when I am able to. So make sure you follow my blog (by clicking the follow button). This will keep you up to date and inform you when I make a post on my blog. I am going to start a new series of blog posts on Using Crystals Intuitvley and for Healing. This will cover different types of crystals I have used, my experiences with them, their healing properties and also I will research crystals for any of my readers that want to know about a particular crystal and make a post on that particular crystal. Which will also include what my experiences have been if I have used that crystal before.